So Google made an Android game. The thing everybody wants to know is, what’s the deal? 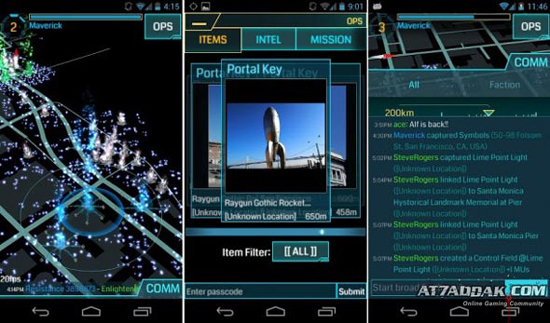 Ingress is a game mapped to the real world, very literally using Google Maps and GPS data. The kick is that there’s a cool future tech theme. The world is changing, a new energy is discovered converging on specific locations, and you can either fight for it or against it. In a very real way you are pitted against another team of cell phone users as you try to slowly gain dominance in various regions of the real world. While some claim this is an augmented reality game, don’t be fooled- there is no camera or real world data being overlayed on, just a digital map reflecting the real world. I’ve tried playing Ingress for a bit and it’s honestly not all that fun. You are just supposed to go find portals and weaken them if they belong to enemies or strengthen them if they are yours. Simple tasks that you can do with a couple minutes of downtime while hanging out. But challenging and complex mechanics aren’t the main draw. Ingress is about exploration. You need to physically go to city landmarks to play. A lot of the fun is the adventure of getting outside and going places while staying very light on the side of a video game. So this is like Foursquare, right? The answer is: kinda. But Ingress is a well polished game with at least enough fiction in place to explain the premise and make it feel like you are fighting an invisible war. The integration of the mapping software is neat and you will feel like you are using an interface from a sci-fi movie. Unfortunately, the chat feature is clunky and hard to use. People around me are talking but I’m not quite sure about what and I can’t chat with them for some reason. The main problem with the game is its opacity. After the tutorial I didn’t know what to do and had to google "How do I play Ingress?". You more or less need to check a web map to discover locations to go to ( http://www.ingress.com/intel ) and as far as I can tell this is the only place the chat works at. Moving on, the *business* of what’s going on here is interesting. Google is openly collecting data, but to what end? Speculation mostly hedges around mapping pedestrian walking routes but others extend the theory to wifi usage and other data. I have a feeling there’s something else going on here. Web advertising is about bringing people from one page to another. An Amazon link takes you to a web site where you can spend money, so Amazon pays sites that give them traffic. What if Ingress was a way to direct not web traffic, but physical traffic? Think about it- real, actual people going to storefronts and areas of interest. If Google could prove to companies that they can get visitors through their doors, how much would that be worth?